Pre-nomad life, one of my favorite things when I lived in New York was having cold brew always ready to go in my fridge. No matter how hot or cold it was outside, I drank this magical beverage year-round and it was pretty much the only thing I looked forward to on a daily basis before heading into my corporate job every morning. As I've been traveling over the past year, I haven't had the supplies to make cold brew and to be honest, I haven't drank much coffee in general since I did the 30 Days to Healthy Living detox back in September. I forwent it that month to reset my gut and every time I drank it post detox, I always had an upset stomach due to the acidic nature of coffee. Over time, the craving just went away really. 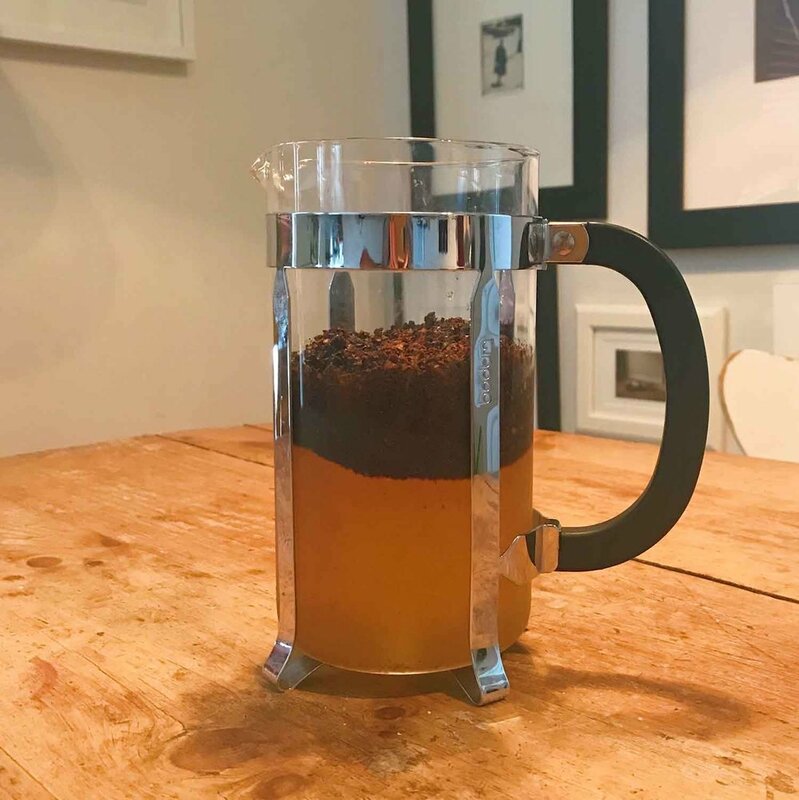 For those new to making cold brew, I recommend using a French Press. While it's not necessary, it will save you time, labor, and way less messy which is always helpful. I didn't have a French press for my first few batches and so I followed this recipe by The Kitchn, but after my boyfriend saw how slowwwww and longggg it takes to strain coffee, he surprised me and bought me this French press and told me "I never want to see you do that ever, ever again. "🤣 So don't be me, or maybe do if you want to get a free French press from your beau too. A French Press. I'm currently using a Bodum Chambord. 1 cup coffee beans, coarsely ground. 1. Pour the coarsely ground coffee beans into the French Press. 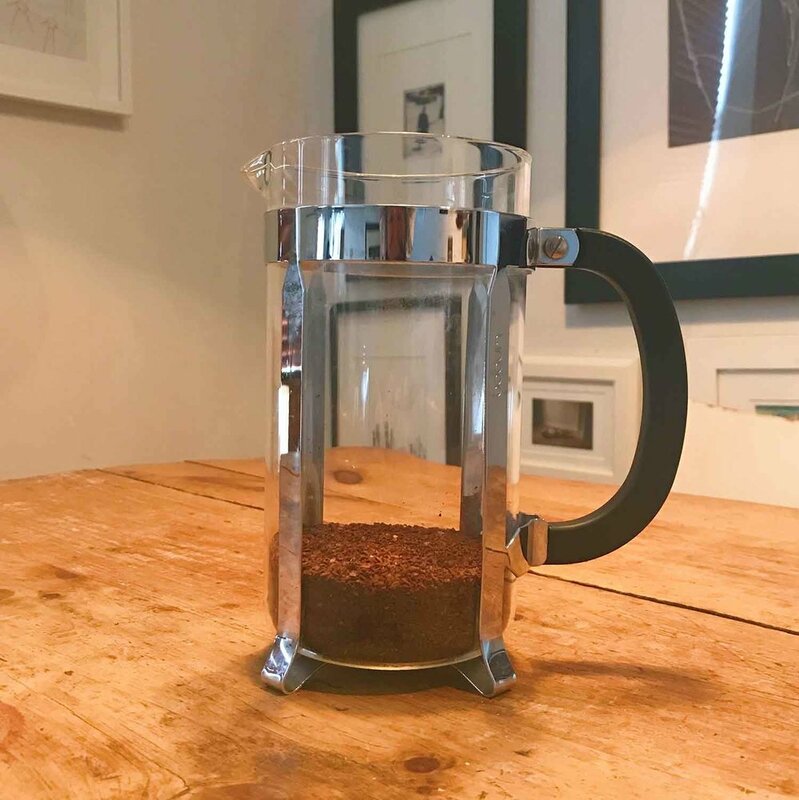 The beans need to be coarsely ground in order to release flavor into the water and also allow the French press to strain properly. You'll end up with grinds in your glass otherwise and no one wants that. For coffee beans, my new fave is Allegro Coffee Vienna Roast but one of my old faves is Stumptown Hair Bender. Freshness is key here so I will often go to Whole Foods and grind recently roasted coffee beans there. You can also visit your local artisanal coffeeshop and have them do it for you as well. 2. Pour the water into the French press. It will naturally be separated like this. 3. Mix the coffee beans into the water with a wooden spoon until everything is more cohesive. PRO TIP: Avoid a metal spoon as this can change the flavor of the coffee. 4. Cover the French press (don't plunge) & leave in fridge for 10-18 hours. The lid unplunged is often too tall to put in the fridge so I use aluminum foil to cover it and place in the fridge. Regarding times, the longer it brews, the stronger the coffee. My favorite batches tend to brew for 10-12 hours as I will let it sit overnight while I'm sleeping or out of the house during the day. 5. Once it is time, put the French press top back on and press down. 6. Pour and have a glass now or put into your mason jars and enjoy later! The owners of my current apartment must be huge jam lovers as they have a wild amount of empty Bonne Maman Jars saved. This comes in handy as I divvy up the cold brew into individual serving-size glasses. 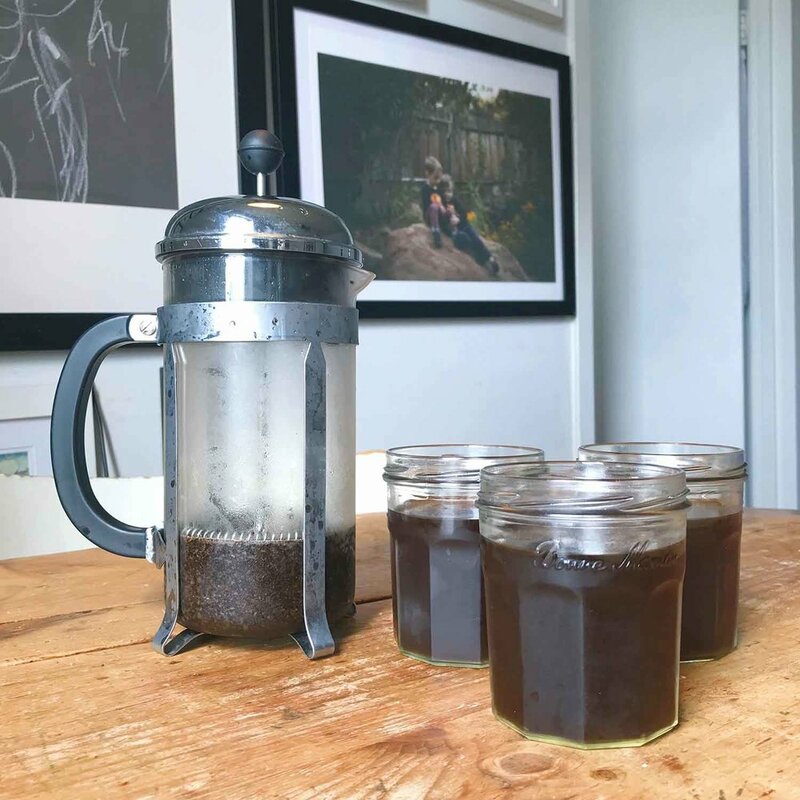 Well, this is my simple guide on how to make cold-brew at home. You can play around with the coffee-water ratio but a good rule of thumb is 1:3. Let me know how it goes when you try the recipe. Always be brewin'!